The Top Five Ways Being A Mama Made Me See Love Differently, With Mindy Willis-Menard. We caught up with one of our favourite Mamas to chat about motherhood last November, and she had some amazing insights on Malas and Mama-hood. 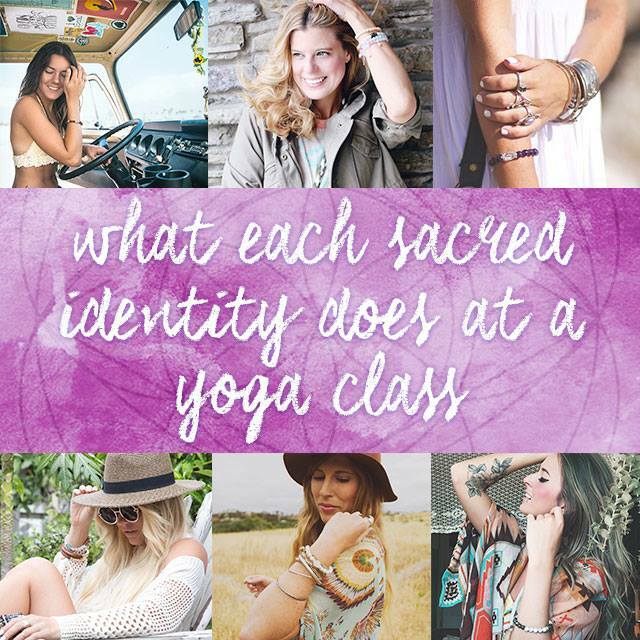 Check out our goddess gal pal Mindy Willis-Menard talking about Mama Malas and the sacred beauty of motherhood below. After she gave birth to her precious boho bella, Mayla, we had the opportunity to ask Mindy what was so special to her about being a mother. Here is what she had to share with us. What did I “LOVE” in my life before recently becoming a Mother? I loved yoga, spontaneity, road trips, cooking, studying, going for long bike rides and runs, rock climbing trips, wine, going out to dinner, quiet time to meditate, and most of all getting a good night sleep. It’s one in the afternoon but somehow it feels like 1am. It could be sleep deprivation that has finally grabbed hold of me after 12 weeks of trying to cope broken bits of sleep here and there. The last 3 months of my life has changed in every way possible. Who knew? Any mother that has been on this journey knows what I am talking about and they also know that no matter what comes up there is this undying love for their child that can not ever be fully expressed through words. My vision of love has changed, how I see love is different after she (Mayla) came into my life. Here are my top 5 ways Motherhood has made me see love differently. A smile. I waited for a few weeks, through lots of full out ball fests for the moment that changed everything for me. Her smile. I have tears in my eyes as I type that because one smile from my daughter brings me to the depth of my heart and the love that I feel for her. Breastfeeding. If I may be truthful there was really nothing natural about nursing, in fact I was very sore after the first few days. I cried about not being able to feed her but with a lot of help from my midwife, doula and lactation specialist I managed to keep it up. Now the fact that I am solely responsible for nurturing our baby and keeping her alive comes from a place of the deepest love for her wellbeing. Cooing. Who knew that the innocent gurgle from our baby could blow me away. Listening to my child learn the very first part of what will be her voice has me head over heels in love. A new love for my own Mother. Years ago I realized I had some apologizing to do. I was not an easy child. Thinking about what my mom went through with my sister and I have only made me love and appreciate her even more. My Husband. 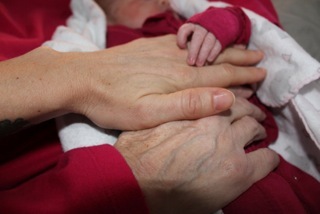 During the labour I was surrounded with love and support. My husband has also been such an amazing supporter of me and my bright ideas since we met. Watching him with our daughter and how he supported her into the world makes me love him even more. I’m happy to announce that Motherhood has indeed changed the way I see, feel, experience and give love back. It has also made me realize how much I Love to sleep but that will come back one day I’m sure. Everything I do now has a deeper meaning. I think about how I want to be a role model for her, teach her about compassion, share what I love with her and hope that she loves it too and most of all to teach about what is most important in this world, love! The love of friends, family, nature, animals and good food. 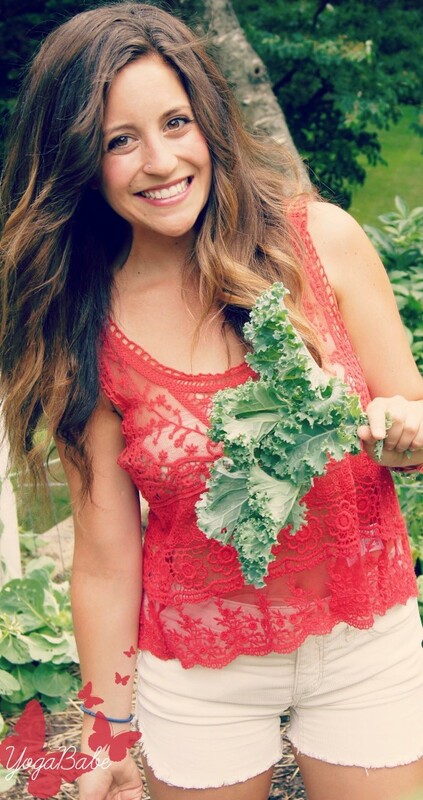 Mindy is a seasoned yoga instructor and health coach based in Ontario, Canada. She’s a proud Shining Shakstar Ambassador and a valued member of the Tiny Devotions community. Our bohemian pals at Papaya Wellness recently told us a little bit about how to live your bohemian dream lifestyle. Check out what they had to say to our team. Let your true self shine, find your natural alignment- act from a place of balance, and calm- and joyfully expand from that place! Create the life of your dreams and do it with a smile from ear to ear, a smile from the heart. Allow the bright fire within the center of your being to guide you along your path. These are our mantras; happily recited with our favorite Mermaid Mala in hand (we are surfers of course)! From that perspective, our yoga practice has blossomed. For us yoga is a lifestyle, a way of being that trickles into all aspects of life, relationships and work. We are easy breezy surfer girls and gypsy globe trotters, who have found home in a foreign and tropical land. Yoga practice has become the constant, steady force of grace in our lives and in our business~ Papaya Wellness! Our daily practice keeps us on track. Sometimes the yoga is soft, and nourishing, offering some respite from the more stormy waves of life, and sometimes our yoga is fiery and challenging, bringing us to a place of vulnerability and ultimately a deeper sense of strength and self confidence. Always our yoga is blissful, and with a sense of humor, a part of each day to be savored completely. Through regular practice slowly we begin to quiet our minds. We tune into the deeper and more subtle hum of our spirit- our inner wisdom, allowing that to be our guide through movement and actions. Slowly we learn to listen, and to give our bodies what they really need. We see the benefits of daily practice manifest in all things. More focus in our work, more mindfulness when relating to loved ones, and more compassion in our community, more love to share! And of course, our favorite piece of the puzzle- yoga provides us with more fluidity in the ocean. Our yoga practice allows us to flow with the waves. Not fighting the ocean and Mother Nature but rather connecting, and yielding when needed. In the ocean’s embrace we connect the body + mind + breath, it all becomes so simple. Through our practice we learn daily to be present, mindful, and to embrace the bliss of each moment. As our eyes begin to open to all the joy and abundance around us, we feel a deep sense of gratitude. We take time to make daily offerings of gratitude, for the small things~ for all things. Waking up first thing, for deep and delicious yoga flows, we spend our days surfing in the waves, connecting with our community and allowing the ocean to dictate our rhythm, letting the warmth of the equatorial sun kiss our skin. We are grateful- for yoga, for our lifestyle and for the opportunity to live our dreams everyday! With Love~ Namaste, Papaya Wellness! 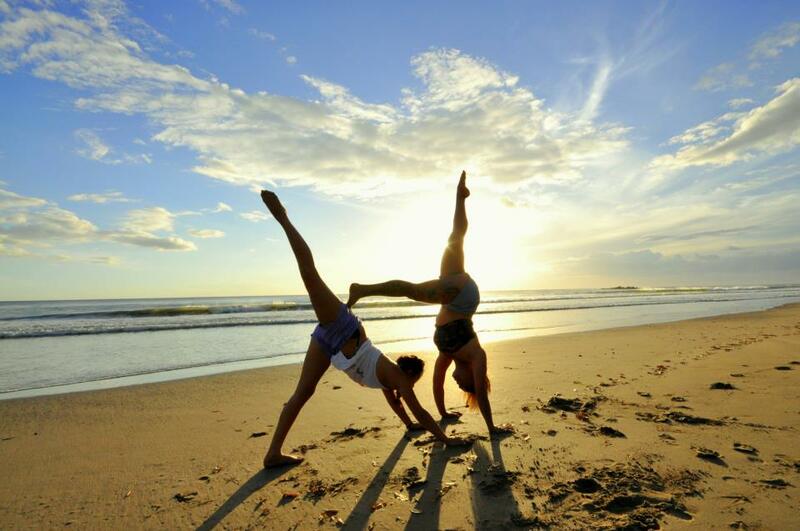 India Reinartz and Carly Chivers joined forces resulting in Papaya Wellness Yoga and Surf Retreats. They are a dynamic duo of beautiful and strong surfer chicas pioneering a remote Nicaraguan village with world class waves on all sides. Filed Under: Boho Community, Intention, Stories. Last May I moved into my dream apartment. Something about it just oozed magic. It was my first time living without another person. Before I’d rented the place, which sat under oak trees and always smelled like maple syrup, I was dreading spending the summer solo. But it didn’t take long before I realized that I’d created a sanctuary for myself. It was my own personal palace that I’d subconsciously designed in which to celebrate and support myself. I’d unpacked plush throws, adorned the place in vanilla candles and hung flowing satin curtains. There was something sparkly about this space that was much different than any other home I’d lived in. Every morning I rose, feeling excited about all of the synchronicities that might happen throughout the day, and late in the evenings I was inspired to write all of my greatest stories. Friends from near and far would appear with gifts and stay late to drink wine, laugh and dance long into the night. We would share stories of all of the places we’d been and the exciting people we’d met there. One night in the thick of the summer, after cooking the largest fresh salmon I’d ever laid eyes on, we sat doe eyed around the stone fire. I looked around. She was right, there were no mirrors in my apartment. May had rushed into June and June shifted smoothly into July. Here we were smack dab in the middle of August and I’d not placed a mirror on any of my walls. I looked around the glow that lit up this circle of my closest friends. My gaze shifted lovingly from pal to pal: Their wide eyes, their open hearts, their curious minds. Then it hit me: I had many mirrors. The mirrors I’d placed around my home were much more valuable than any picture of myself in a glass reflection. The home I’d created and the beautiful gal pals in it were the best mirrors I could have picked out. Next time you’re self-reflecting, pop on your Awakening Mala and remember that all that you have created in your life is a beautiful reflection of who you are, no mirrors required. Confessions of a Bohemian Fashionista – Going Boho… It’s an Inside Job! When you remember something sweet, it’s a crime not to share it. A couple of years ago, I did a 30-day challenge. Attend yoga every day for 30 days straight. It seemed simple—all I had to do was plop my yoga mat down (back row, center), do some downward dogs and try not to wobble too much in tree pose. It happened one evening, mid-challenge. I was sitting there post sweat, one eye open, wondering what all of these ‘yogi’s’ could be thinking about (other than grocery lists, next weeks to-do’s, or that fight they had last week.) They all just seemed so relaxed, so together. As I left the studio, there she was. I thought I’d seen her here before—or maybe it was at that café or in the market. In a glimpse she flashed me a crooked smile, shot a peace sign my way and danced off. She didn’t have to say it. There was a glitter from below her eyes that told me she’d walked along the ocean’s edge, kissed an elephant in Bali and Om’d until her voice went soft. You could tell she was a light-worker. 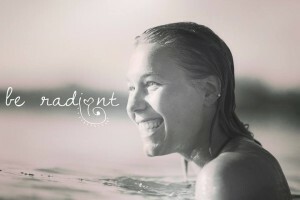 She’d been through tough situations and come out lighter and shinier. It’s been years since I saw that girl who seemed like a real live goddess. She was practically wearing a crown. Since that sweaty night I’ve mastered my tree pose, learned to keep both eyes closed in my favorite yoga poses and most mornings I sing to myself. It was one of those mornings today; I could feel it in the air. Something stopped me in the mirror before I left for work. There she was staring back me, the soft glitter under her eyes, the divine intention in her smile. It hit me, hard—that boho girl is me, that boho girl is you. 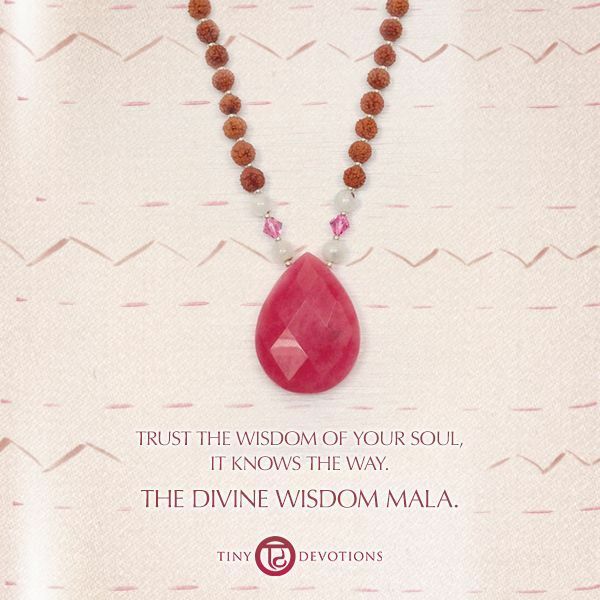 I’m wearing my Divine Wisdom Mala as I think back on that night, and remembering that going boho is an inside job. So go ahead, boho goddesses, flash your beautiful smiles at a stranger and remember you’re divine. Hey there! My name is Dana and I’m the founder of YogaBabeLife.com. My mission is to help women to celebrate what sets them apart, and absolutely adore their life and the body they’re living in. I’ve lived with Crohn’s Disease for as long as I can remember. Just over a year ago, I was told by my doctor that I would need to have my entire colon (large intestine) removed because it had become so severely diseased. So much so that not removing it would be fatal. This was an extremely scary situation, it meant that I’d be living with an ileostomy (a bag attached to my stomach that the you-know-what comes out of!) for the rest of my life. I don’t like to admit it, but at first, I thought I’d rather die than live with an ostomy. How would anyone ever want to be around me, how could anyone ever love me? It was paralyzing. The hospital had become my second home, and my desperate attempts to resist surgery only made me more weak. On December 7th, 2012, I had my entire colon removed. There are no words that can come close to describing the process that I have had to go through in order to accept and love my body again. It’s been a roller coaster. But, I find comfort in my faith, in returning to my mat, building my strength through working out, and feeling how much stronger my body has become without the disease weakening me. I am so passionate about helping other women to love and accept their own bodies no matter what they think their biggest imperfections happen to be. I felt such a strong call to launch YogaBabeLife.com within months after my surgery. I’ve been blessed with the opportunity to lead an amazing international community of women. I’ve found that allowing myself to be vulnerable is what heals me. Opposite of what we think, vulnerability draws us closer together than setting us further apart. My yoga mat has become a sanctuary, a safe place, for me to begin to love my new body. My practice helps me to cultivate compassion for myself, my body, and for the community that I serve. I’ve found that yoga and meditation force me to be present, to push through the tough feelings that come up, and to be grateful, rather than resentful, of the obstacles I’ve faced. There is beauty in vulnerability. Allow yourself to step into who you truly are meant to be, and you’ll give others permission to do the same. Embrace your scars and express gratitude to the challenges in your life. Wisdom is a shift in perspective, and challenges arise as opportunities for growth. Allow each of your obstacles to soften your heart and expand your love. Filed Under: Boho Community, Boho Girl, Stories. We connected with the buddhaful Gypset Goddess to show our community why this yogi is so amazing + inspiring! Simple, I said YES. A friend invited me to a yoga class, and I said yes. Life is all about choices. I choose to say yes to new experiences as often as I can. A chance to try something new? Yes. An opportunity to make a new friend? Yes. A chance to go to someplace that I’ve never been before? Yes. It’s so easy to say “no”, but it’s so rewarding to say “yes”. 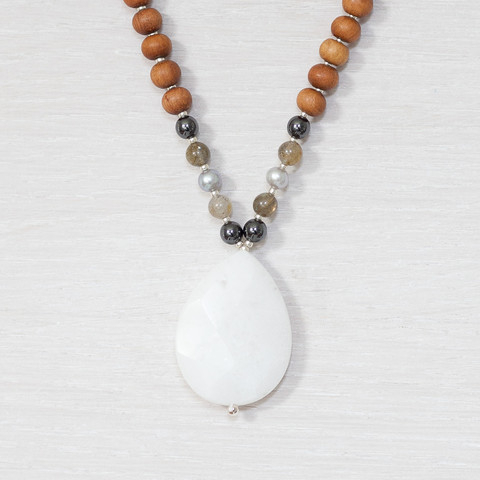 What is your favorite mala, and why? My favorite mala is the Babe Mala. I connected with the intention behind it, and the combination of colors and materials, immediately. One of my mantras is: “Believing in possibility makes everything possible. I believe that everything is possible.” Sometimes my insecurities speak louder than my heart, and I am susceptible to fear and self-doubt. The Babe Mala reminds me to listen to my heart, and have the confidence and knowledge that I can manifest my goals and dreams to become my reality. I am inspired by courage. This can manifest in many different forms. Trying new things, going new places, meeting new people, conquering fears, rising above adversity. It’s not easy to leave your comfort zone, but a full life waits on the other side. People who have the courage to try, to risk failure, to fail, and to try again, are the people who change the world. Changing the world can happen on a very small or very grand scale, but if no one ever had the courage to try, nothing would ever happen. This makes me think of a sang that always makes me smile: “How do you eat an elephant? One bite at a time.” I don’t eat elephants, but I always think of this sang when I think of intentions. I set them one hour at a time, day at a time, one week at a time, one month at a time, etc. My advice is this: If you believe that anything is possible, then it is. Follow your heart, and you’ll see some amazing places.